The presence of a little third notch on Bonito Notched and Temporal points has interested me for a number of years. I first saw these point types in person in 2011 while helping teach for the Archaeology Southwest Field School out in southwest New Mexico. These points were made throughout the western half of New Mexico and into eastern AZ. I wouldn't be surprised to see these points in northern Mexico given prehistoric interaction. People made these points during the Late Prehistoric period, Pueblo II to III time frame, placing them around A.D. 950-1150. Bonito points were in vogue in Chaco Canyon during the Classic Bonito phase (A.D. 1020-1120) when construction at the massive Pueblo Bonito was completed. Check out Justice 2002:254 for info on how these relate to earlier Chaco point forms. 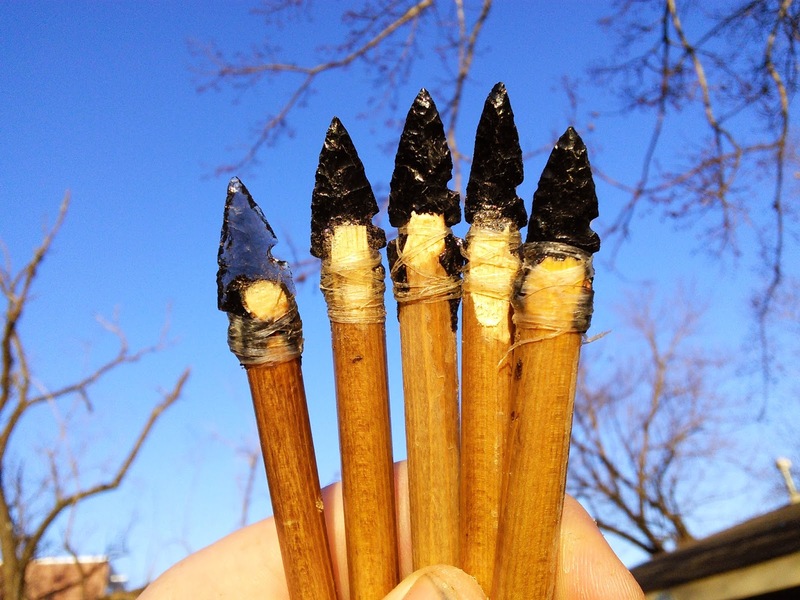 Bonito points were contemporaneous with non-triple notched points for some time, as both types have been found together in excavated arrow bundles at Pueblo Bonito (Judd 1954). Temporal points occupy a more southerly region and are more or less restricted to southwest New Mexico and eastern AZ. These points also have a third notch along one margin and date to the Late prehistoric; around A.D. 900-1200 is a good ball park date range. The points were typically made from flake blanks and often exhibit the original flake scar from core removal. I can typically produce a point of this kind within 15 minutes. They are thin, sharp, and a welcome asset to any quiver. 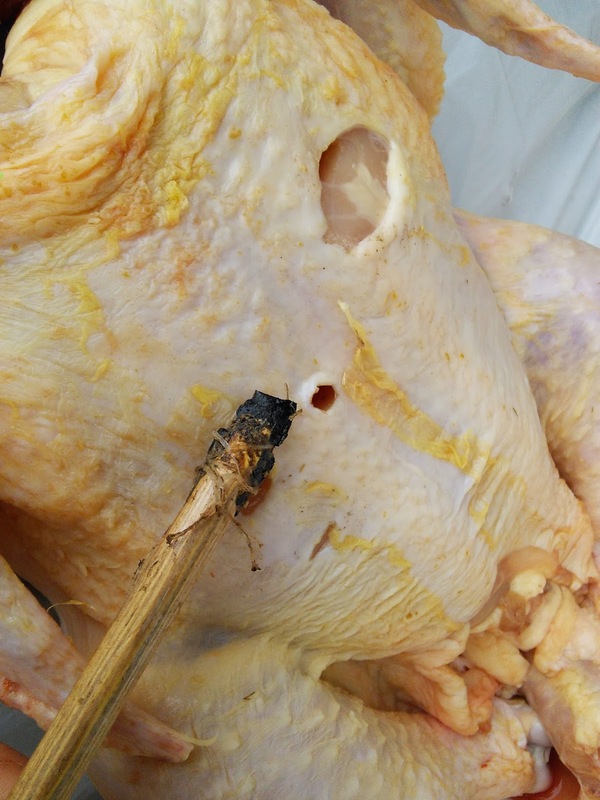 The third notch was not used as an additional element for hafting the point to a foreshaft as hafted points have been found at Pueblo Bonito with sinew wraps only around the lower two notches (Justice 2002:41; Cosgrove 1947). So, is a third notch on one side a technological advantage, or should we look outside of technological function to explain this attribute? I wanted to see if the single third notch along one side aided in consistent and predictable fragmentation. If the points failed to show a clear advantage over serrated points or normal point breakage patterns then we might start entertaining ideas of social, rather than technological function. for a pilot study I created five hafted points with a single notch on one side. 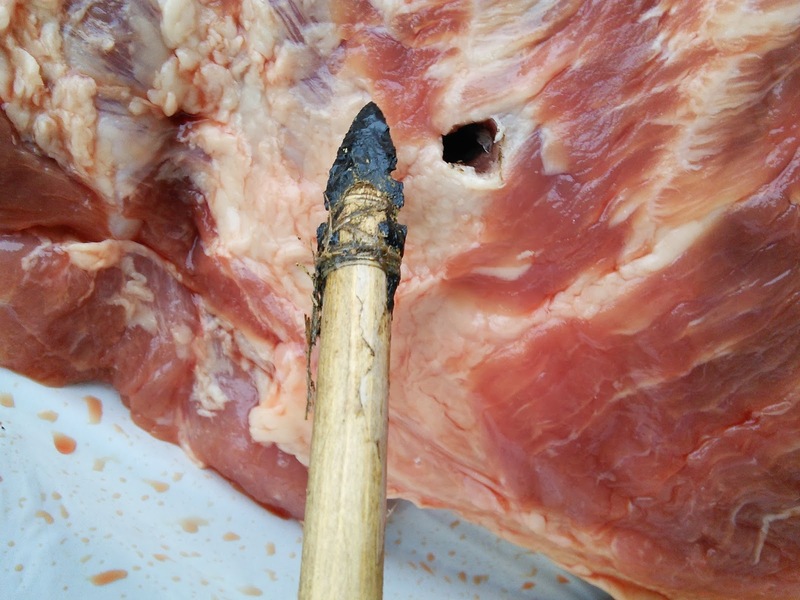 These points were shot with a recurve bow into meat targets until breakage was achieved. The broken points were observed for breakage patterning to understand technological function versus a more vaporous social marker. All points functioned well and took several hard impacts prior to any sort of impact damage. As always, I would want more data. Only one point exhibited a break along the third notch. All others broke at the tip or at the intersection of haft and point, where in my experience a majority of breakage occurs during impact. At this point I cannot comfortably attribute the single third notch as a technological advantage over serrated points or straight-edged points. The third notch did not make breakage patterns more predictable, nor did it make the point into some kind of frangible arrow point. I can see why we would think the third notch functioned as as technological advantage. for instance, perhaps the third notch was a quick way of making the point break apart on impact with bone, which is a good thing in some cases. But, this was not the case. The points broke in relatively normal order. In fact, the points took just as much of a beating prior to breakage as any other point. I had to shoot the points through sinew and light bone up to five times before any type of breakage occurred. This is of course luck of the draw, as one major bone impact on the first shot would cause a break. But, at the end of the day, shot after shot, the points did not show any superiority in breakage patterning to other points tested so far. Perhaps in this case we have a social function or marker of time and place flaked into stone rather than strict technological choice. More tests will help, but for now I have been persuaded to look at these types as a mark of identity, rather than technological/functional adaptation. Possible social functions? Your guess is as good as mine. 1947 Caves of the Upper Gila and Hueco Areas in New Mexico and Texas. Papers of the peabody Museaum of American Archaeology and Ethnology, Harvard University 24(2). 1954 The Material Culture of Pueblo Bonito. Smithsonian Miscellaneous Collections Vol. 124. 2002 Indiana University Press, Bloominton, Indiana.